In: Offshore Technology Conference. Offshore Technology Conference (OTC-2018) April 29-May 4 Houston Texas United States OnePetro 2018. In: Proceedings of the 14th International Symposium on Artificial Intelligence. International Symposium on Artificial Intelligence, Robotics and Automation in Space (iSAIRAS-2018) 14th June 4-7 Madrid Spain ESA 2018. In: Smart Energy 2018. Fachtagung Smart Energy (Smart Energy-2018) 9. November 8-9 Dortmund Germany Smart Energy 2018 vwh 2018. In: Proceedings of the Embedded World Exhibition & Conference. Embedded world Exhibition & Conference befindet sich Embedded World 2016 February 23-25 Nürnberg Germany 2016. In: Rolf Drechsler, Ulrich Kühne. Formal Modeling and Verification of Cyber Physical Systems. Seiten 224-248 ISBN 978-3-658-09993-0 Springer Heidelberg 9/2015. In: Journal of Field Robotics 32 - Special Issue on Alternative Sensing Techniques for Robot Perception 1 Seiten 167-185 Wiley Blackwell 2015. 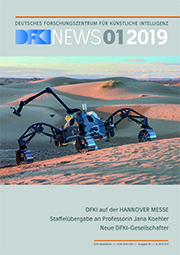 In: Robotics and Autonomous Systems (RAS) 67 Seiten 115-121 Elsevier 2015.